GRAND RAPIDS, Michigan JUNE 27, 2016 -- ArtPrize, the radically open international art competition and festival decided equally by public vote and expert jury, today announced the artists and venues slated to participate in the eighth annual event. Concurrently, ArtPrize announced the recipients of $50,000 in Artist Seed Grants, presented by the Frey Foundation, and the launch of a $10,000 CrowdRise Matching Grant Challenge for artists, made possible by the Michigan Lottery. The $500,000 competition will take place once again in downtown Grand Rapids, Michigan from September 21–October 9, 2016. A total of 1,554 artists representing 44 countries and 40 U.S. states submitted 1,453 entries for the eighth edition of the world’s largest art competition. For the 2016 event, Venues have been building more focused and tightly curated exhibitions, including historically populous venues, as well as four city sites that are now part of the new Featured Public Projects granting program. “After eight years of the Artist and Venue connections process, Venues are refining the ways they select entries and curate their exhibitions. While this is making the ArtPrize landscape more competitive for artists, it is evidence of a deeper understanding of contemporary art and the curatorial process. Ultimately this improves the visitor experience,” noted Kevin Buist, ArtPrize Director of Exhibitions. Participating artists’ works, entered under one of four categories—2-D, 3-D, Time-Based and Installation—will be displayed at 171 venues across the three-square-mile ArtPrize district. Artists and venues found each other online at artprize.org and organized their own shows through a collaborative curatorial process. In the U.S., Midwest states beyond Michigan with the most participating artists include Illinois, Indiana, Ohio, Wisconsin, and Minnesota while leading states outside the Midwest include New York, California, Texas, Florida, and Colorado. A complete list of participating artists and venues can be found at artprize.org/entries. For the third consecutive year, registered ArtPrize artists sought to be awarded one of 25 Artist Seed Grants presented by the Frey Foundation, valued at $2,000 each. Members of the ArtPrize Art Advisory Council reviewed the applications, seeking ambitious entries from artists who demonstrated both financial need and artistic merit. Eric Souther, Search Engine Vision "ISIS"
New for 2016, ArtPrize is teaming up with the Michigan Lottery to offer an additional opportunity for all connected artists to raise financial support for their ArtPrize Eight entries. The CrowdRise Matching Grant Challenge—which launched at Noon today, June 27—will offer ten $1,000 matching grants to the first ten artists to reach a goal of $1,000 from at least ten unique donors in their own CrowdRise.com crowdsourcing campaigns. 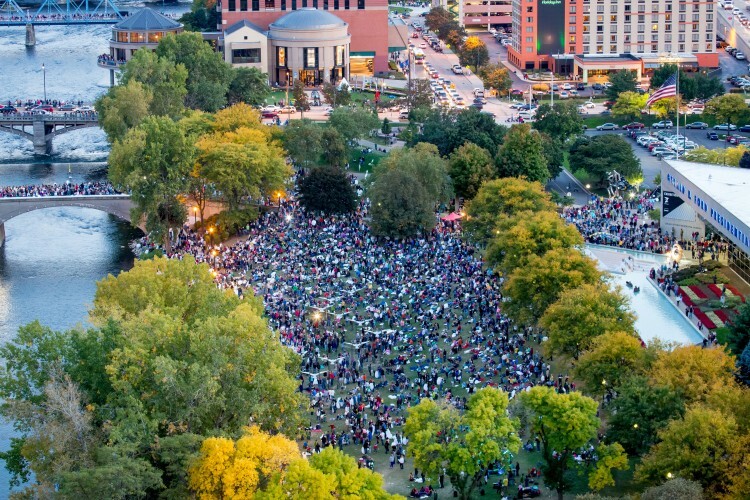 To qualify, artists must have successfully made a connection with an ArtPrize venue. By funding this new matching grant challenge, the Michigan Lottery seeks to further nurture the vitality of the annual event and spur conversation and catalyze creativity. Learn more and support ArtPrize Eight entries at crowdrise.com/artprize2016. The ArtPrize Artist Seed Grants and CrowdRise Matching Grant Challenge are part of an expanding portfolio of ArtPrize granting programs, totaling over $280,000 in 2016.